Mikkel Andresen scored the match-winning try as Kenilworth edged past Spartans. Kenilworth overcame a strong and competitive Spartans side on Sunday to reach the final of the Warwickshire Shield with a last-gasp 21-19 victory at Old Coventrians, writes Bruce Doe. It was a display of skill, commitment and sheer dogged determination from a Kenilworth side missing a few first-team regulars. The game started in a hailstorm and Kenilworth immediately put pressure on the Sutton Coldfield side’s line through their forwards. Spartans endured that early pressure before the roles reversed. Continued pressure and a drive from their pack, with the occasional involvement of their three-quarters, resulted in Spartans touching down near to the corner through Matt Southam. The conversion, in squally conditions, was missed. Kenilworth responded with a series of drives towards the Spartans line which created space on the left. The ball was shipped through three pairs of hands to winger Hector Smith who finished well in the corner. Alex Selby’s missed conversion kept the scores level. More Kenilworth pressure followed but their efforts were only rewarded with a penalty from fly-half Selby to give them a slender three-point lead at half-time. Following the restart, Kenilworth were soon on the scoresheet after a sustained period of pressure where both backs and forwards made in-roads. A penalty and resultant lineout win saw the hard-working Nick Gerber, with the help of his pack, drive over for Kenilworth’s second try, which remained unconverted. Spartans responded well and got themselves back into the game, again mostly as a consequence of their forwards driving effectively. Bit by bit they edged closer to the line and eventually touched down near to the posts, once again through Southam. The conversion from Thomas Hardy closed the gap to a point. Despite another successful penalty from Selby, Kenilworth’s nerves kicked in and their concern was compounded when Spartans yet again put them under considerable pressure on their way to scoring a try through Perry Bates-Powell near to the posts. Hardy added the extras to establish a 19-16 lead for his side. 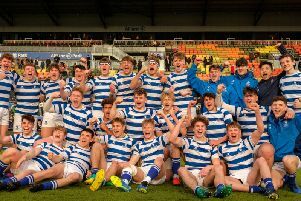 Kenilworth reacted superbly, however, aided by the return of powerful back-rower Mikel Andresen who put everything into achieving what went on to become the game-clinching score. With less than ten minutes remaining, Spartans chose to see the game out by keeping it within their forwards. While they achieved a series of phases, it was inevitable that it would come to an abrupt end, with Kenilworth turning the ball over through Selby. This was the opportunity for Kenilworth to turn the tables and following a series of pick and drives, Andresen went over in the corner much to the delight of the Kenilworth supporters. Although the try was unconverted and a restart was required, Kenilworth held on to successfully see the game out. Kenilworth will now meet Midlands Two West (South) rivals Earlsdon in the Shield final.